As one month ends and another begins the Steam Hardware and Software Survey is updated. As we reach 2017 it is interesting to note Microsoft's latest OS has reached a new milestone. 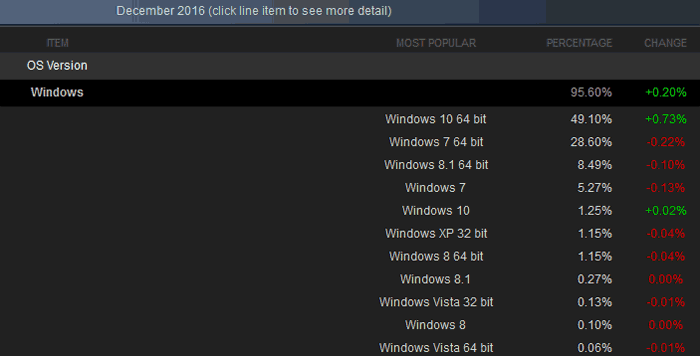 Now, according to these latest figures, Windows 10 is the OS of choice for greater than half of all Steam users. 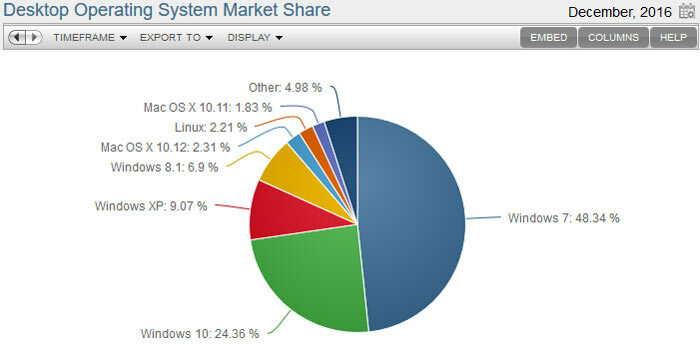 As might be expected, all other versions of Windows lost market share in the most recent recorded month. Windows 10 gained 0.75 percentage points in December. Considering it has been 16+ months since its launch the sub percentage point monthly increase isn't to be sniffed at. 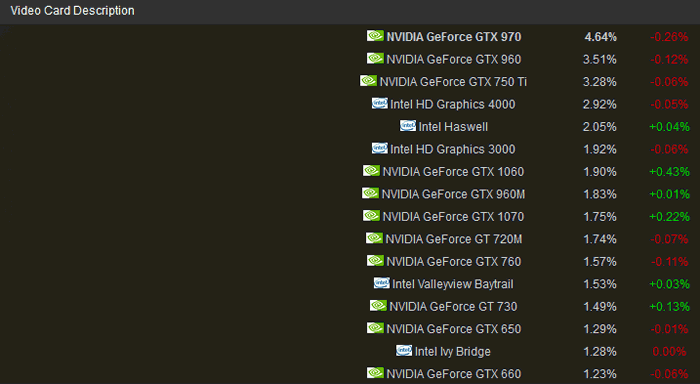 Sifting through the Steam data it's interesting to see the graphics card trends playing out. The biggest winners in December were Nvidia's GeForce 10 series, particularly the GTX 1060. AMD's Radeon RX 460, 470, and 480 did OK too, climbing 0.16, 0.16, and 0.11 percentage points respectively. Gamers are often seen as early adopters of new hardware and software technologies, and the Steam survey shows that theory holds some water. Elsewhere, in general OS usage surveys, Microsoft's Windows 10 is having a hard time cracking the 25 per cent milestone (see below). Looking forward there are signs that Microsoft is going to cater even more for gamers, with the impending Windows 10 Creators Update. Last week we noticed new Windows 10 'game mode' settings in an insider release of the OS. Thats sad the AMD 400 series are so low. The 480 has made very good gains with recent driver updates (up to 10% in some cases). Its sad how gaming is becoming so Nvidia/Intel focussed… Just hoping Rizen will allow AMD to shake it up some more.